Boston Development Group has filed plans with the city for The Merano, a 444,000-square-foot, mixed-use development in Boston?s Bulfinch Triangle near North Station. The project would include 213,000 square feet of office space, two Marriott hotels and retail and restaurant tenants. The proposed location is Parcel 1B, Massachusetts Turnpike Authority land made available when the elevated Central Artery came down, and two adjacent parcels. Boston Development has financing in place for the $160 million project, according to Richard Wakeman Jr., vice president of acquisitions and development. ?We would hope to be permitted this fall and break ground at the beginning of the year,? he said. The planned hotels are a 153-room Courtyard by Marriott and a 121-room, extended-stay TownePlace Suites. Both are moderately priced brands. Their lobby would be on the third floor of the building, which would have 226 valet parking spaces on the second level. The ground floor would be dedicated to 36,000 square feet of stores and restaurants. 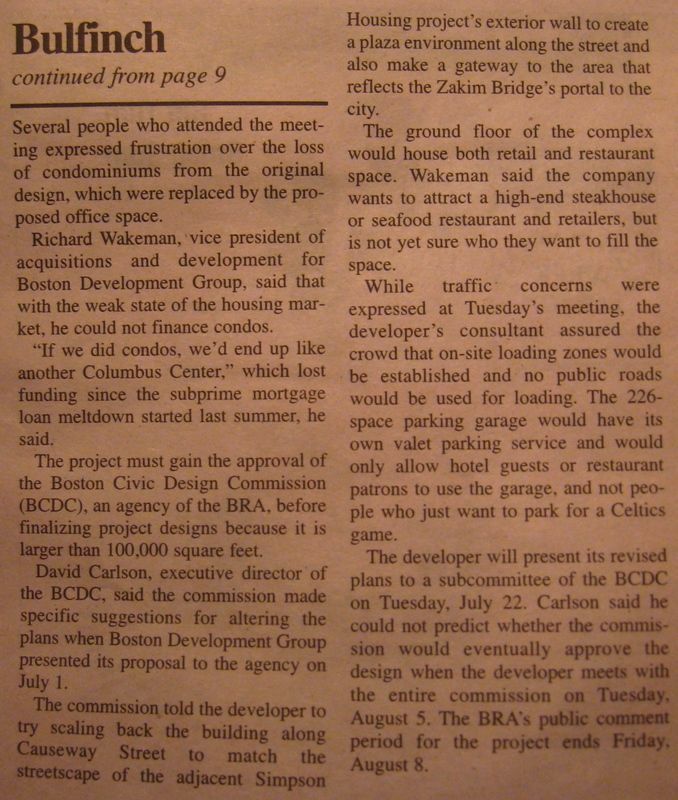 The Pike chose Boston Development as the site?s developer in 2006. The Newton company?s original proposal included housing units and the construction of three stories on top of its existing buildings at 239 Causeway St. and 98 North Washington St. But rental housing is difficult to finance right now, and a desire to preserve the views from the Strada234 condo building prompted the changes, Wakeman said. The company named the project after the northern Italian city of Merano to tie it to the North End. Community support for it is expected, said Robert O?Brien, executive director of the Downtown North Association. Boston Development is a well-known property owner in the neighborhood. The community helped create the Bulfinch Triangle redevelopment guidelines and was involved in the competitive bidding process to select the developer, he said. I was holding out such hope for this area. Looks like another pre-fab landscraper. Environmental considerations ought to outweigh aesthetic ones. Nice to see a developer and architect think "green". Way to go recycling the highly successful "One Charles" design drawings. Well....at least it creates density. So does fiber in your diet! The Boston Redevelopment Authority has approved a $160 million hotel, office and retail project in Boston?s Bulfinch Triangle neighborhood. Construction work is slated to begin during the first quarter of 2009 and is expected to take two years to complete. The project will also bring approximately 240 construction jobs and about 275 permanent jobs. Dubbed The Merano, the project will include two moderately-priced hotels ? a 153-room short-term hotel and an 121-room extended-stay hotel, as well as 206,000 square feet of office, 10,000 square feet of retail space and 13,000 square feet of restaurant space. The hotels will be operated by the Marriott Hotels. 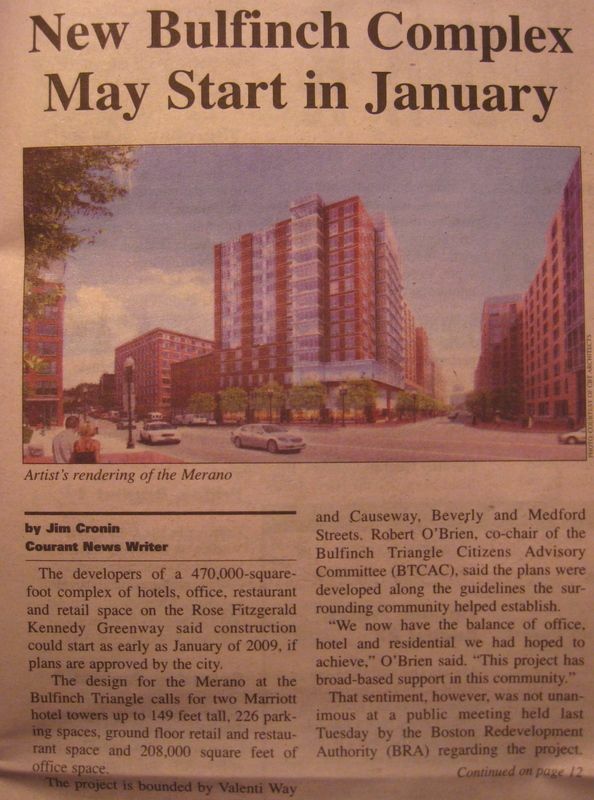 Located across from the TD Banknorth Garden and in close proximity to the Rose Kennedy Greenway, the hotels at The Merano will accommodate tourists and fans attending events at the Garden, according to a BRA press release. The demolition of the elevated I-93 highway helped make the 54,900 square-foot property available for development. It consists of three parcels owned by the Massachusetts Turnpike Authority. The development team includes: Boston Development Group; architecture firm CBT Inc; permitting consultant Epsilon Associates Inc.; Engineering firm Howard/Stein-Hudson Associates Inc. acting as transportation consultants; and the law firm Goulston & Storrs LLP as legal counsel. The project includes public benefit such as: $50,000 to support a comprehensive traffic study of the Bulfinch Triangle neighborhood in coordination with the Boston Transportation Department; $75,000 to support neighborhood improvements; $300,000 for the city?s Crossroads Initiative; $12,000 for the Bulfinch Triangle Streetscape Improvements Initiative and the generation of substantial annual property and hotel taxes. Good thing this is a pair of hotels -- the design is a sure-fire cure for insomnia. "Brian the Homeless Guy", who lives in one of the project site doorways, says some labor activists are getting ready to picket on account of unfair labor practices allegedly perpetrated by the developer elsewhere. Brian was careful about the use of the word "allegedly". Maybe Brian has a future as a paralegal, Toby. Last edited by JimboJones; 08-12-2008 at 10:49 PM. The short term hotel will be great for people who miss the last train after a game at the Garden..... and for prostitutes. ...and barroom hook-ups, nooners, and the occasional heavy-weight drug deals. The hookers would be the most urban aspect of this project. They'd be good grit? Does he self-define as "homeless" or are you applying labels? "Allegedly-homeless" guy is much more appropriate. No, Brian lives in one particular doorway and is fully self aware. He was a Gold Gloves boxer about 35 years ago, took a couple too many. Buy him a drink sometime and help him forget what he can't remember. But you have to ask Brian because he won't ask you. He has high standards of conduct. Brian doesn't say "Have a good day" to everyone on the top of Milk St. near Wash does he? Side note I met the rapping homeless guy on Boylston the other night I forget his name it was late. Apparently alot of people know him, he's always coming out with a CD, supposedly. The neighborhood around North Station and the new Garden is becoming a hotel hot spot. City Hall?s development arm yesterday signed off on plans by the Boston Development Group for a $160 million mixed-use project on a key Bulfinch Triangle parcel not far from North Station. The 400,000-square-foot-plus Merano features two hotels, a 153-room Courtyard by Marriott and a 121-room extended-stay TownePlace Suites by Marriott. Also in the works are 206,000 square feet of office space, 10,000 square feet of ground-floor retail space and 13,000 square feet of ground floor restaurant space. That brings to five the number of hotels in the emerging neighborhood of condos, apartments, shops and offices around the North Station/Garden transportation and entertainment hub, notes Robert O?Brien, executive director of the Downtown North Association. In another sign of the area?s growing interest to major hotel chains, the Shawmut Inn is now in the process of being converted into a Holiday Inn. ?It is becoming quite the hotel area,? O?Brien said. Hotel chains are drawn to the North Station area by a number of factors. The lineup of games and concerts at the TD Banknorth Garden provides a built-in market, with at least one neighborhood hotel booked full for last night?s Celine Dion concert. With other parts of the downtown full of luxury hotels, the more budget-minded lodgings taking shape in the North Station area are also proving a hit among business travelers looking for lower-cost alternatives. ?This will be huge,? said Jessica Shumaker, a spokeswoman for the Boston Redevelopment Authority, of the new hotels near North Station. ?They will be moderately priced. We don?t have too many hotels in that price point.? Why does this rendering differ completely from the image published on July 19th? This one is much better, but could be much better still. I believe this is the building that will be directly in front of you as you come over the Zakim Bridge. What a lost opportunity. It's a shame that in a neighborhood that takes its very name from Boston's greatest architect, we can't expect something better than what's being built here.